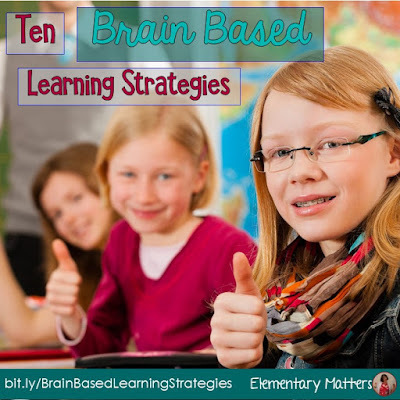 If you have been reading my blog for a while, you know that I'm absolutely fascinated by the brain, and am particularly fascinated by the research that's been done to prove the best learning strategies. There's some great stuff out there! I read about the brain and learning daily, and just can't get enough. I've taught a few workshops about it, too. Even though I'm a second grade teacher, this stuff applies to all learners, from newborn babies to adult learners. 1. Talking! Research has taught us that learners don't learn much from sitting and listening. Sure, they need to listen a bit, but they need the opportunity to talk! The talking internalizes what they've learned. In my classroom, I'll give the children a few tidbits of information, then they have "turn and talk" time, where they discuss what they've learned. They love this, and it works! 3. Visuals! Vision is the strongest of the senses. Talking alone isn't enough. Make sure the children have plenty to look at in addition to what you say. Use posters, drawings, videos, pictures, and even some guided imagery with the children to help them learn. 4. Chunking! The typical attention span is the child's age plus or minus a couple of minutes. That means that many of my second graders can't attend past 5 minutes. Again, proof that typical "lecture" type teaching just doesn't work. That means they need a chunk of information, then an opportunity to process that in some way. Here's where "turn and talk" works, as well as an opportunity to write, draw, or even move. 5. Movement! Combining movement with the learning almost guarantees stronger learning. Here are some ideas: Counting by tens while doing jumping jacks, touch three desks while naming the three states of matter, and this one, from a blog post I wrote in the fall. 6. Shake it up! If you do exactly the same thing, exactly the same way, it becomes boring and the brain tunes out. Don't get me wrong, there are a lot of good things about sticking with a routine, but once in a while you need to shake it up! Have a backwards day, turning the whole schedule around (within reason, of course!) change the seating arrangement, do one part of the day completely different. We need this in our own lives, too, don't we? 7. The brain needs oxygen! They say 20% of all the oxygen used in the body is used by the brain. That means we need to get the kids up out of their seats regularly and moving! I particularly enjoy the Brain Gym exercises. I recommend the book, but there are also plenty of Youtube videos on brain gym that will model the exercises for you and tell how they help learning! Of course, there's nothing better than old fashioned jumping jacks or running in place. And the kids love it! 8. Make connections! We talk about connections in books a lot, but connections are important for the brain. It can't hold random information, it needs to connect to something else that's already there. Did you ever hear a kid say, "I remember that because I know...." You can make connections through your own experience and stories. I often talk about my daughter, my cat, or some other thing they know of to make something else come true. 9. Feedback is essential! Practice doesn't make anything better unless the practice is accurate. Students need to hear they are on the right track. I use a color code to let the children know if they are on track, which I described in this blog post from September. It works pretty well for motivation, as well. 10. Music is magical! Tell the truth, how many of you know all the words to a television commercial? People my age know all the words to the Gilligan's Island Theme Song and the Brady Bunch Theme Song. Did we work hard to learn those? Nope, never even tried! Because they were put to music, we learned them. There are many studies on music and learning. One way I use music is that I often play "happy music" first thing in the morning. That way the children enter feeling good. Now this brings us back to #2 emotions! Hi Sally - I just LOVE this post!! Have you read Brain Rules by John Medina? (I hope I haven't already asked you this. . . ) His book got me SO much more interested in meaningful movement and ways to spark the kids' brains and get their dendrites firing. I'm eager to dig into one of the books you've recommended, too - thanks! Brain Rules is on my wish list of books to read! Thanks! Thanks! Most of this stuff is instinctive to teachers! I like it because it backs up what I always believed about how kids learn! Thanks so much! I'm fascinated by the brain! A good brain book is A Whole New Mind by Daniel Pink. But, I bet you have already read that one. I, too, am a teacher that is fascinated by the brain and all things cognitive, from left- to right-brain. I am a right-brainer myself. I try to introduce more right-brained tasks into my classroom since the bulk of students' academic lives have traditionally leaned to the left. The 21st century calls for more right-brained skills, or at least some balance between the two hemispheres. I'm not familiar with A Whole New Mind. I'll have to add that to my wish list. The 21st century is starting be quite different from teaching in the 20th century. I'm enjoying it! I'm reading A Whole New Mind right now. I teach elementary Music and Gifted Ed;this book has given me 1. Validation as a Right-Brainer :) and 2. Lots of ideas when it comes to teaching my young ones. I love this post, and I love that you remain so enthusiastic and positive about teaching. This is my 29th year, and I have created a website to share ways I have learned to apply brain science in the classroom to teach reading and math. Games and strategies are all kid tested and approved so I hope you and your visitors will stop by. Pat, I love your website! I'm sure I'll be visiting it frequently! Are you familiar with Whole Brain Teaching. "Class-Teach" is like your "turn and talk". Based on what I read here, I think you might be interested since you can take many of those strategies and categorize it with one or more of your 10 brain based learning activities. You can check out the site at www.wholebrainteaching.com. I also have a blog with a few videos at www.mrscrookswbt.blogspot.com. Enjoy and great job with your blog! I'm very familiar with Whole Brain Teaching, and I'm a big fan! You can often find me on Tuesday nights watching Coach B's webinars. Great stuff! Thanks for sharing your videos. I'm your newest blog follower! 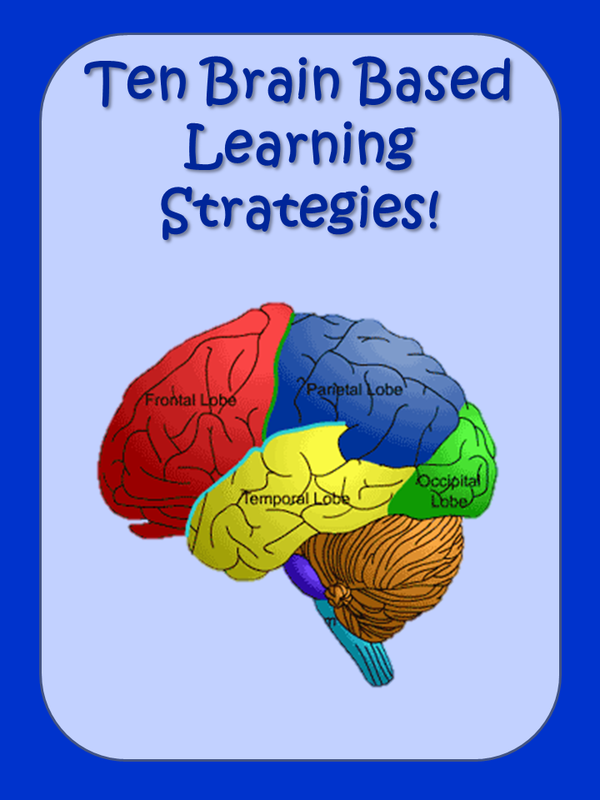 I really enjoyed your post on brain based learning strategies. I am currently pursuing an MS in IDT at Walden University and we are implementing blogs (and RSS feeds) into this semester’s curriculum. Part of the weekly assignments is to seek out and follow other blogs that discuss similar subjects to our course study. This week we are studying the brain and how it affects our learning. I also work with a team that is responsible to train Army Soldiers on an operational space system, so we are continuously concerned with how new Soldiers learn and we find ourselves tweaking the material and presentations to adapt to the class (be it an advanced class or one with very little space experience). The concepts you discuss in your post would go a long way in helping to break up the monotony of our lectures (which unfortunately are the bulk of our curriculum), and I’d really like to try to use your ideas, such as the “shake it up”, “movement” and “chunking” with our Soldiers. My feeling is they would find it comical at first but then would likely enjoy the change of pace, it would improve their learning, and would make it fun at the same time. Thanks very much for the ideas! I've been to plenty of adult workshops and trainings that use many of these strategies. The adults are too busy learning and having fun to think it's silly! 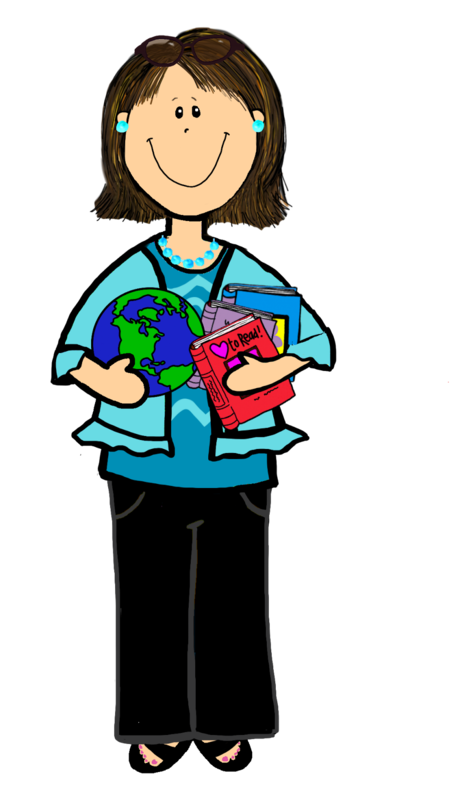 Great post , thank you for sharing the books that helped you learn more in this area. That list of books is just a start, there are tons! This is a terrific post! Thank you for sharing it! I'm so happy to have found your blog! 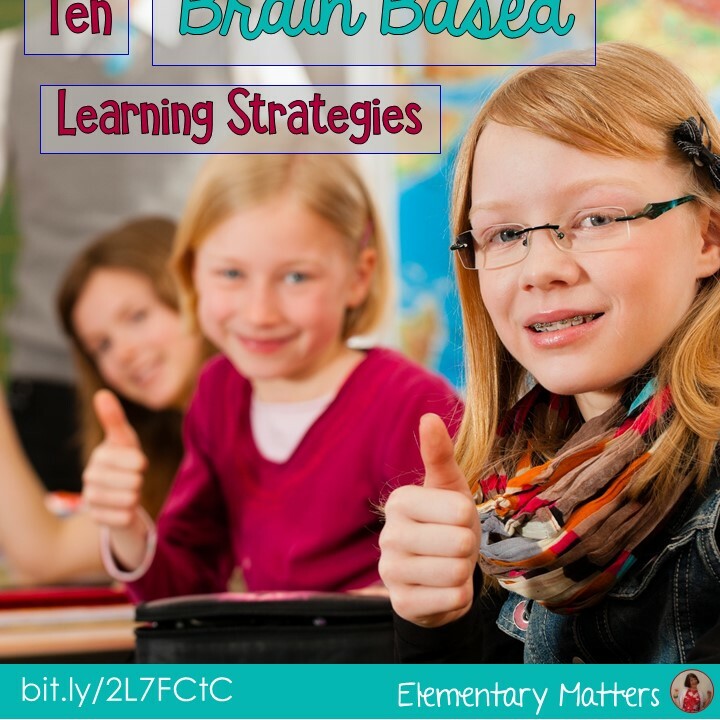 I'm also very interested in brain based learning strategies! Thanks for the info.! Good strategies. It is really perfect and useful that would surely help many people to know about those important strategies that would make them successful. These ideas re so great and loving. I do not have enough study about the brain and emotions but this post is sounding good for it and allow us to know about the things we do in our daily life and how we can deal without emotions. Individual games are also one of the best ways to learn the things and get help from it. I was excited to read this blog. I've been to Eric Jensen's workshops on Brain-based Learning and Teaching and read many of his books. Also many of the books people have suggested. I'd like to suggest two more. I just love Terry Doyle and Todd Zakrajsek (2013) The New Science of Learning: How to Learn in Harmony with your Brain. I also must recommend my book, Straight A's Are Not Enough. I wrote it for high school and college students but Howard Gardner in his endorsement says "it's recommendations are useful for learners of all ages." Daniel Pink, author of A Whole New Mind says it will inspire young people to form life-long learning habits. 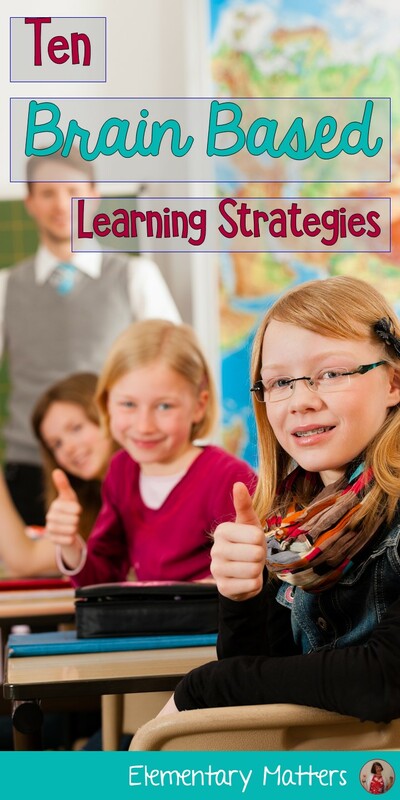 These are great teaching strategies for all ages of students. I teach eighth graders, and they need to be up and out of their seats as much as younger kids. Most importantly in middle school is talking. Middle schoolers are natural talkers and socializers, which can be a teacher's best friend if we capture their interest and get them discussing and exploring academic material together. I recently read that the person doing the talking is probably the person doing the learning! Thanks for these strategies! Thanks, Matt! It takes a special person to work with Middle Schoolers, and yes, they need to talk! Thanks for your comments. Vital Test Extreme your body. Your body can get the adequate measures of Vital test extreme s with the assistance of expanded nitric oxide. It takes a shot at giving you a superior Vital test extreme ual existence with your accomplice. EnduroRush Muscle helps in improving your Vital test extreme ual excitement by expanding your stamina. It gives you the expanded vitality levels with an improved and invigorated inclination. It..